Ask any marketer what the starting point and backbone to a successful digital marketing strategy is and chances are they'll tell you that it's content. Content is the spark that ignites an effective marketing strategy and what keeps it going strong throughout, but not just any content will do. What you use for your digital marketing should be quality content that draws in readers and helps drive traffic to exactly where you need it to be. If you can build a solid foundation with great content, the rest can be built upon that. So, how do you go about creating content that's not only good, but also catches people's attention and makes them want to learn more? During my time in the marketing industry I've learned countless strategies, read endless tips and heard so many secrets centered around creating great content for digital marketing. I eventually found that, no matter what I was reading or hearing, the basic message was the same. There are guidelines your content should follow, certain aspects that make it appealing to a reader. From this realization came my three rules of content: Informative, Interesting and Relevant. No matter what niche the content is for or where it will be posted, these three characteristics are a must for quality content. 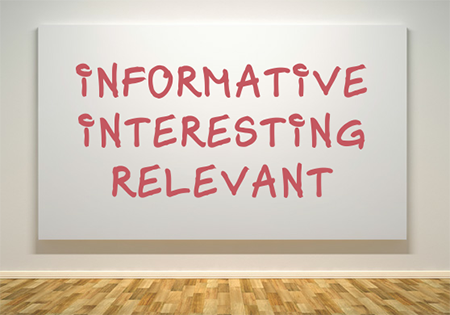 Informative: The content should provide valuable and useful information to the reader. It should teach them at least one or two things or answer at least one question they have. This can be adjusted depending on where the content will be published (such as a blog, website, add or social media) and what the main purpose of the content is. The information can range from general information like you might find in a blog post, to strategic information like you might find on a website or in an ad. For example: If the main purpose of the content is to showcase the products and services a company offers, the information provided should teach the reader what these products and services do and why they're beneficial. If the purpose of a piece of content is to drive traffic to a certain website, the information provided should tell the reader why they need to go this website and what visiting the website will do for them. Interesting: While information is a key factor in great content, information alone won't do the trick. You have to keep in mind that real people are reading this content, so it has to be interesting; the content needs to catch and keep their attention from the title to the last period. Things like facts, statistics, metaphors, analogies and funny anecdotes are all great ways to keep people interested in what they're reading. Another good rule of thumb is to not be too technical, keeping a conversational tone and using words and phrases that are easily understood is your best bet when it comes to keeping your readers reading. Nobody wants to read blog posts full of technical jargon or boring drawl. Ask yourself this question: If I stumbled across this piece of content online, would I be interested enough to read it in it's entirety? If the answer is no, try and figure out why that is and how you can change that. Relevant: The final rule for creating great content is also one of the most important. 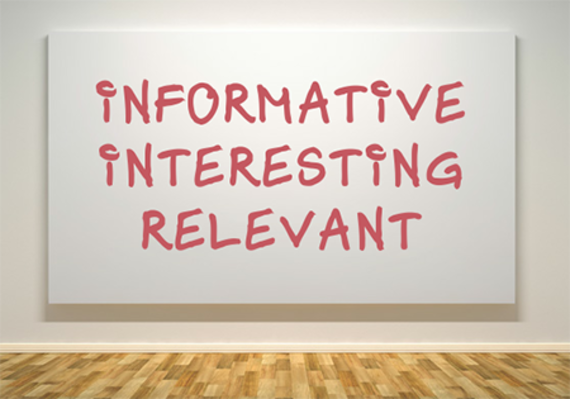 Relevance applies to a few different things: The content must be relevant to the niche, business, or company that it's being written about. In addition to this, it must also be relevant to the audience it's being written for. Knowing your target audience is important, but ensuring the content you're writing is relevant to that audience is even more important. Writing properly relevant content comes from doing research: Knowing enough about the subject of your content and who it is being written for to make it relevant to both. This is another thing that is going to keep your readers interested and wanting to read more. Following these three rules will help you create quality content that will be effective in any area of digital marketing. Anytime you complete a piece of content, ask yourself: Does the content follow these three rules? If the answer is no, it's essential that you read through what you've written and figure out why. Without these three elements your content will have a hard time accomplishing what you need it to. Things like driving traffic and attracting readers will come easier when your content is informative, interesting, and relevant.